On Thursday, Christophe Cuvilier, Chairman and CEO of Fnac, France and Europe’s largest cultural and electronic retail chain, introduced the company’s new ereader called FnacBook. Eager to stress that books and ebooks can develop harmoniously side by side (books represent almost 20% of Fnac sales), Cuvilier presented the slim — 1 cm thick — elegant ereader, which weighs 240 grams and can store 2,000 books or up to 10,000 by adding 16 GB. The FnacBook, built by French high tech company Sagem, uses E ink, has Wi-fi connection and free 3G connectivity in France provided by mobile carrier SFR. It will go on sale for 199 euros in mid-November; in time for Fnac’s Christmas season. 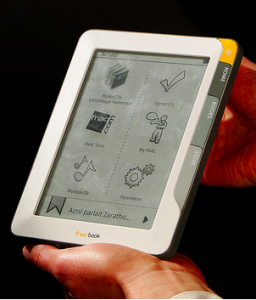 A competitor, Oyo -– the e-reader from France Loisirs and Chapitre.com — will go on sale at the end of this month. The company’s e-bookshop is developing rapidly and has negotiated agreements with all major French publishers. That said, FnacBook’s most attractive feature is the link to Fnac’s online bookshop which already offers 80,000 e-books, as well as 750 digital graphic novels, which are immensely popular in France. Fnac.com’s e-bookshop is already available for iPods and iPads and soon for Androids. The Fnac was founded in 1954 by two Socialists with the intention of providing affordable products for workers/ It has since evolved into a company with 14,632 employees that made 4,375 million euros in revenue in 2009. Cuvilier is known for his dynamism and attention to detail. He worked for Fnac’s parent company Pinault Printemps Redoute (PPR) for almost ten years before taking over at Fnac and has been active in developing the company’s online business and now the FnacBook. Cuvilier and his team admit that ebooks in France are far more expensive than in the US. In France, they are only offered at a 20-30% discount from traditional books. However Cuvilier stresses that he is anxious to see the fixed book price be applied to e-books. This is an issue that is currently under discussion in the French lower house of Parliament and in the Senate. If the e-book is granted the same status of the book, this will enable it to benefit from the low book VAT of 5.5% rather than its current 19.6% VAT.